In an article for Consumer Guide Auto’s main Website, “Two Dogs Get a New Car,” Yours Truly related how he came to buy a 2010 Volkswagen Jetta TDI SportWagen. We closed with a promise to report on it later. That was nearly two years ago, and only now are we getting back to you. Why? Because there’s been little to report. To recap, I bought the Jetta in May 2010, about three months after the death of my life partner left me with two VW GTI V6 hatchbacks (my green Y2K and his silver ’02). Because test-vehicle driving leaves me little time for enjoying one personal car, let alone two, I decided to trade the GTIs for my first factory-fresh ride since 1972. Why the Jetta? Well, I’d never owned a wagon, a diesel, or a turbo car, and I was impressed with the punch and refinement of VW’s 2.0-liter TDI engine. Also, these diesel Volks match or beat comparable hybrids on emissions and fuel economy—without the added cost and complexity—and I liked the thought of feeling as eco-smug as any Prius owner. But the main reason, of course, is that this seemed like the perfect car for transporting our beloved Boxers, big-boy Loki and little-girl Pepper. Where the hatchbacks were two-door inconvenient and a bit small inside, the four-door Jetta lets the kids scamper in and out of the back seat with ease, and there’s still ample cargo space behind. As it happened, the car I bought was waiting right out front at Lunde’s Peoria Volkswagen, which had recently opened near my home in suburban Phoenix—and has proved to be the best dealer I’ve ever done business with. The only options were rear-side airbags, an iPod connector, a “Sport and Protection Kit” (mudflaps, heavy-duty floormats, cargo mat), and dealer window-tinting. Everything else I needed and wanted was standard, including durable leatherette (vinyl) upholstery. Despite best intentions, I logged only a few thousand miles the first year, due to lack of time and the slow, painful process of reconstructing my life. It also took a while to work out a convenient means of getting the kids buckled up, as I did not want to risk having them injured in a sudden stop or evasive maneuver. Eventually I found an easy-fit, fleece-padded harness with a D-ring on the back and a tether with a stout, claw-type clamp at one end for hooking onto the LATCH anchors. This allowed the tethers to be left in place and then clipped to the harnesses at the other end when it was time to go bye-bye. Still, the three of us had no reason to go much of anywhere until last summer, when a dog friend recommended the daycare service at a spacious, well-staffed animal hospital about 20 miles away. The kids tried it, loved it, and have been going three times a week ever since. With that, I began piling on some miles like a “normal” owner. VW’s 3-year/36,000-mile bumper-to-bumper warranty includes free scheduled maintenance, and my Jetta needs routine service at reasonable 10,000-mile intervals. The car finally reached 10K in March and duly went in for its first service—basically just an oil change, fluid topping, tire rotation, and general checkup. But because we were nearly a year late showing up, VW required that my dealer perform the 20,000-mile routine instead, which covers the same things and a few more, but was still gratis. And that’s all there is—as you’d jolly well expect of a car so young. The Jetta may not be the most exciting thing on four wheels, but it’s pleasant and easy to drive. It’s a quiet loafer on the freeway, needing only 2000 rpm at 70 mph in the 6-speed manual transmission’s top gear, and midrange passing power is strong with the 236 pound-feet of torque on tap. That’s rather a lot for a car of this size and weight. Other plus points are the same as stated two years ago: firm but absorbent ride, excellent crosswind stability, great visibility, comfy seats, no-guesswork controls, terrific fit/finish, and attractive, if hardly luxurious, cabin décor. Diesels are famous for fabulous fuel economy, and this one’s no exception. I’ve kept careful track, as I do with test cars, and consistently get low-40s averages in routine city/freeway use no matter how hard I flog it. That’s by manual calculation, but the trip computer has proved surprisingly accurate. Just as nice, I don’t need to even think of topping up until the trip odometer nears 500 miles, which means a month or so between pit stops. I reckon it has a 600-mile highway range at 60-75 mph, somewhat less if climbing the Continental Divide. Complaints are few. The audio display washes out in bright light, as touchscreens are wont to do. The pointers on the climate-control knobs are a bit small for these senior eyes. Flipping the sunvisors makes a horrid cracking noise in Arizona summer heat. And the upper door panels acquire a whitish tinge, also due to interior heat, though it’s easily removed with plain water and a terry towel. 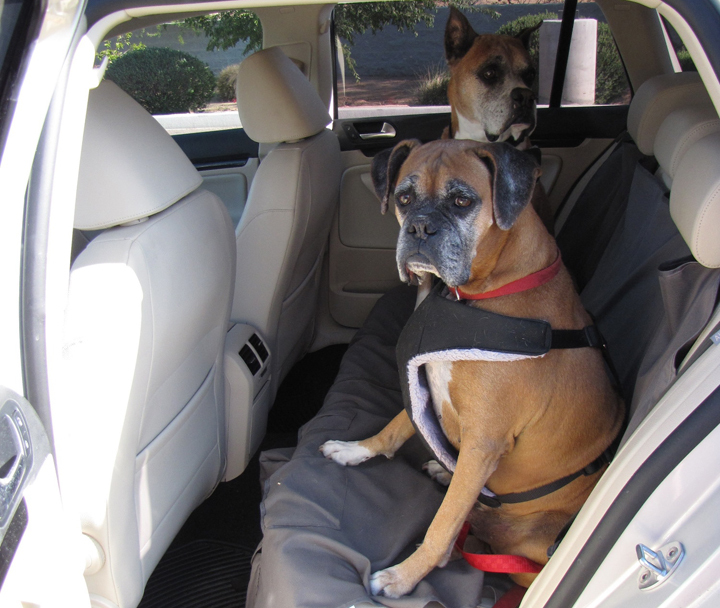 Happily, the rear-seat area shows virtually no wear from its frequent canine occupants (helped by a pet-store seat cover). So there you have it. Am I happy? You bet. And you might be too if this car fits your needs, as the 2012 Jetta TDI SportWagen is little changed from my 2010 except that you can’t order rear-side airbags anymore. Must write a suitably huffy letter to VW about that. I’ll have more to say about diesel cars and the market for the same in an upcoming blog. Meantime, thanks for reading this one. Loki and Pepper send sloppy Boxer kisses. Written by: Chris Poole on July 4, 2012.on February 25, 2019.